Crafting with items that you already have on hand is always the best way to reuse materials and save money. Egg cartons are one of those common materials that most people have in their kitchen already. There are so many ways to use them in crafts and this easy snail craft is one of them! Turn those boring egg cartons into colorful and cute snails for your spring garden or classroom. Your kids are really going to love this craft. 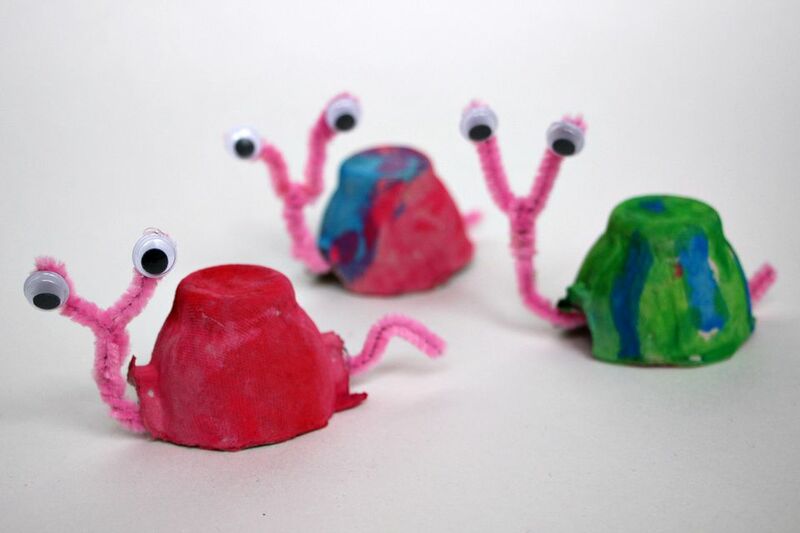 Click through for a step-by-step tutorial for making this cute preschool snail craft. The first step in this easy craft is that you need to cut out each individual cup of the egg carton out. These will be your snail shells. Next, paint each egg carton and let them dry. Next, it's time to create your snail body. Twist your pipe cleaner into a "Y" shape, keeping one end long. Shape the paper cleaner into the egg carton and glue into place. Attach the googly eyes with glue or hot glue. Aren't these just super cute? Your little egg carton snails are ready to take off and explore! This is a great preschool project for spring and garden units. Plus your kids will have a blast making them and they can be as creative as they want with the shell designs!